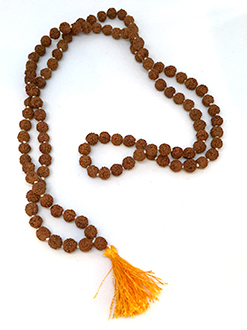 If you have found meditation difficult, it may be easier to use a mala while repeating a mantra. It could be a sanskrit mantra or an affirmation in any language. You can say it aloud or silently to yourself. Sit comfortably, grounding your sitting bones with your spine comfortably erect. You may sit on the floor, a cushion, or a chair. Put your mala in your right hand with one of the beads next to the tassel/pendant between your thumb and middle finger. Close your eyes and feel you are gazing through the middle of your forehead, between your eyebrows. Take 3 deep breaths, feeling the air fill your body. Continue long deep breathing as you begin saying your mantra. Focus on the words of the mantra even if you don’t know what they mean. Say it one time for each bead. Once you have said your mantra 108 times, hold your mala between both hands in front of your third eye and take 3 more breaths. Come back to your surroundings gently.